Americans spend a lot of the time at the grocery store, and the ability to access a coin counting machine could draw even more consumers into these locales. The U.S. Grocery Shopping Trends 2016 report from the Food Marketing Institute revealed that the average American makes 1.6 trips to the supermarket each week, spending a total of $107. For many people, that's no small investment, which is why a large number of shoppers aren't willing to settle for any old grocery shopping experiences. The study found that 52 percent of people bypass their most convenient grocery store option in favor of a more distant market because it lacks the prices, products and services they want. Don't allow your store to be bypassed - invest in the amenities your customer base is looking for. One in-demand feature you may want to consider investing in is a coin-counting machine. Discover magazine reported that a whopping 80 percent of Americans save their change as opposed to spending it - that means there are a lot of coins jingling around in your customers' pockets. When the time comes for them to count their savings, don't you want your institution to be the first place they think of when considering where to go? By adding a coin counting machine to your market, you're benefiting both your business and your base. Newsday reported that as consumers in one section of Long Island, New York, became more aware of the value of their change, their appreciation for local coin counting services grew, too - in 2009, one bank chain in the area reported processing nearly $62 million worth of coin counting transactions. People seeking coin counting services outside of financial institutions - which sometimes only offer these amenities to their account-holding members - found allies in some of their local grocery stores. Over 130 supermarkets on Long Island offered coin counting machines in 2010. Although some of the penny-pinching was being done by merchants and small businesses, Long Island bank teller Brittany Petry told Newsday that her financial institution estimated that the majority of its coin counting customers - about 70 percent - were individual consumers looking to cash in on their extra pocket change. The source noted that most people it interviewed, whether they were counting their coins at a bank or supermarket, were organizing their change so they could put it toward play rather than work. 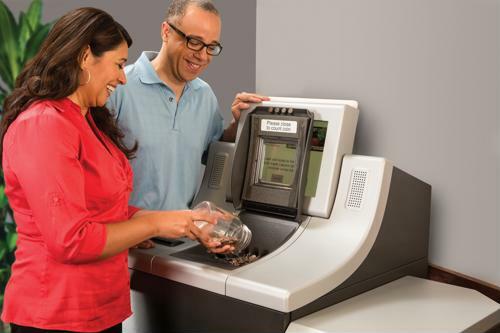 By bringing a coin counting machine into your store, you could inspire patrons to spend their "fun" money on the spot, brightening their days and boosting your profits. To fully take advantage of the benefits of having an in-store coin counting machine, you need to spread awareness among shoppers. Let your patrons know that by simply gathering the loose change they ignore each day - whether it be sitting in the cup holders of their cars or wedged between their couch cushions - they can add a little more money to their income. Make sure to reach out to the traditionally cash-strapped younger generations, especially students, who are always looking for opportunities to beef up their bank accounts. Another demographic to market to is people who work in the hospitality industry, like bartenders, servers, maids and other professionals who make cash tips. You may also consider tying in the concept of coin counting to other store sales - for example, point out that products could easily be purchased with the coins consumers are resting on.